Not only does professional lawn care make your home more attractive, it also lets you enjoy your outdoor space without having to maintain it. EnviraScape is your choice for reliable landscaping, lawn maintenance, lawn care (including grass cutting), and tree care. We have lawn care options and maintenance plans for residential and commercial customers in North Carolina and South Carolina. No job is too big or small for our team of lawn care experts! Every homeowner wants a beautiful lawn accented with trees, flowers, and shrubs. Unfortunately, lawn maintenance takes time. With help from EnviraScape, you can have the beautiful, healthy yard you want…and still have time to enjoy it! EnviraScape Can Make Your Lawn Beautiful! If you’re dreaming of a healthy, carefree lawn, call EnviraScape for free estimates on lawn maintenance. We’ll work to give you healthy grass, trees, and shrubs and will get rid of outdoor pests. Contact us today to learn more about our lawn maintenance services. We guarantee that you’ll be 100% satisfied with your results because we care for your lawn just as we would our own! Commercial grounds maintenance: Don’t let a brown, brittle lawn give off a bad first impression of your business. We provide full-service commercial grounds maintenance for all types of facilities. From office buildings to churches, medical practices to schools, we’ll keep your grass looking good. We’ll work with your schedule and budget to determine how often we need to come and what services we need to provide. Best of all, your lawn will be worry-free. EnviraScape will take care of it all. Industrial grounds maintenance: The grounds at an industrial facility can sometimes be overlooked. Add to that the wear and tear from truck traffic or machinery and your green spaces may need some TLC. Our crews will help you keep any grass or landscaped areas looking their best all year long. Residential grounds maintenance: Your home is your retreat, the place you come to for relaxation. Don’t you want it to be as beautiful outside as it is inside? With our residential grounds maintenance service, we’ll make sure your grass is cut, your shrubs are trimmed, and your trees are pruned. Talk with us about your needs and we’ll help you set up a schedule that will keep your yard looking great no matter the season. Turf & ornamental: Our landscapers are experts in turf and ornamental grass. That means that we can fix whatever problems your lawn has. Whether it’s at your home, business, or a commercial facility like a golf course, we’ll come out and take a look. Using our knowledge and tools like soil testing, we’ll determine the best treatment plan to give you beautiful green grass. Pruning: Pruning is a great way to manage the growth of bushes, trees, and shrubs—if you use it correctly. Professional landscapers know when to prune which type of plant. They also know how much to take off and which methods should be used. The end result is a plant that looks great now and will be healthy and vibrant in the future. Shrub maintenance: Maintaining shrubs takes a little effort but can pay off in a big way. However, many homeowners aren’t sure what their shrubs need to succeed. EnviraScape can help! We’ll clean out unwanted plants, add mulch, trim away excess growth, and fertilize as needed. If you’d like to add shrubs to your landscape, we’ll help you choose the right ones—and the right place to plant them. Pesticide applications: In a perfect world, every lawn would be free of weeds and disease. Unfortunately, that’s not the case. Responsible application of pesticides can make all the difference. But beware: Many homeowners do more harm than good by applying the wrong pesticides in the wrong way. Let our professionals help. We’ve got the training and experience needed to do the job right. Mulching: You know you’re supposed to mulch, but do you know why? Mulching is one of the best ways to nourish your lawn. By returning these clippings back to the soil, your lawn will get nitrogen, which is necessary for growth. Our lawn maintenance team will evaluate your lawn, determine when to mulch, and take care of it for you. Aerating: Aerating is the process of putting holes in your lawn to help the grass grow stronger. The holes provide the roots easier access to water, air, fertilizer, and other necessary elements. It also breaks up the soil, thatch growth, and any debris that’s covering the ground and your grass. Don’t go to the time, hassle, and expense of renting an aerator when we can do it for you! Seeding: Does your lawn need a little boost? Seeding gives you a chance to add fresh green grass to your yard. While you can tackle this chore on your own, you’d have to know the best type of seed to use, when to plant it, and how to nurture it. Hiring our lawn maintenance company to do the work takes all the worry away. 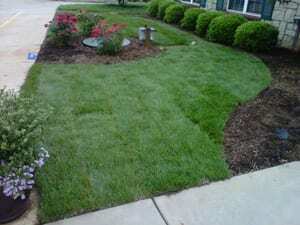 Fertilizing: Fertilizing is another part of lawn maintenance that requires a lot of know-how. If you apply the wrong mixture at the wrong time, you could do damage to your grass—or just waste your money. Avoid both by calling EnviraScape to handle the job for you. EnviraScape is a fully insured, professional lawn care and landscape company. We serve Charlotte, NC; Rock Hill, SC; Lancaster, SC; Fort Mill, SC; Indian Land, SC; Kershaw, SC; Fort Lawn, SC; York, SC; Lake Wylie, SC; and Chester, SC.